When I got it cut and styled at the end of October, the stylist said going one day without washing it out of every 10-15 would be a good thing. It would cut down on the brassy yellow that develops. So, today was that day. Every weekend, either Saturday or Sunday, I haul out the purple shampoo and give it a wash in purple goodness. I average 15 days in letting it go one day without washing. But I tell you, in spite of some people's assertions that you don't need to wash your hair other than running water through it, my hair gets limp and greasy-looking if I go a second day without a wash. I can't stand it. Maybe that's conditioning, the self-imposed idea that it looks bad if I don't wash it. I'm still kind of amazed at how that brown dye, now almost 2 years old, has stubbornly clung to the ends where it's not been cut off. I don't notice it until I take a photo and there it is. And it's interesting how gray hair isn't completely gray. Some strands still produce melanin. It's really noticeable right after washing. I did wonder how different I would look if I got a box of Nice 'n Easy 118, the color I used to use. 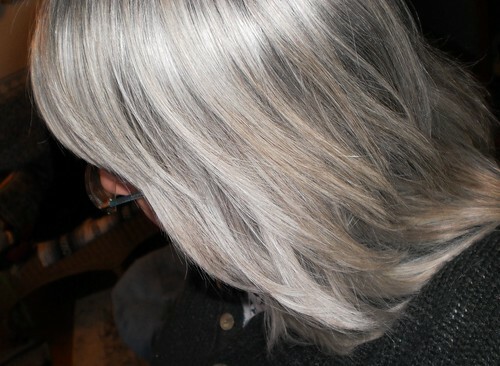 I like my gray hair, make no mistake about that. It's who I am and a favorable cut makes all the difference in the world. But sometimes, I look at that image in the mirror and remember when that was brown hair. The reverie comes to a screeching halt when I remember how long it took me to grow this out and what I looked like when it was 3 inches of gray and 5 inches of brown. Some things I don't need to revisit.